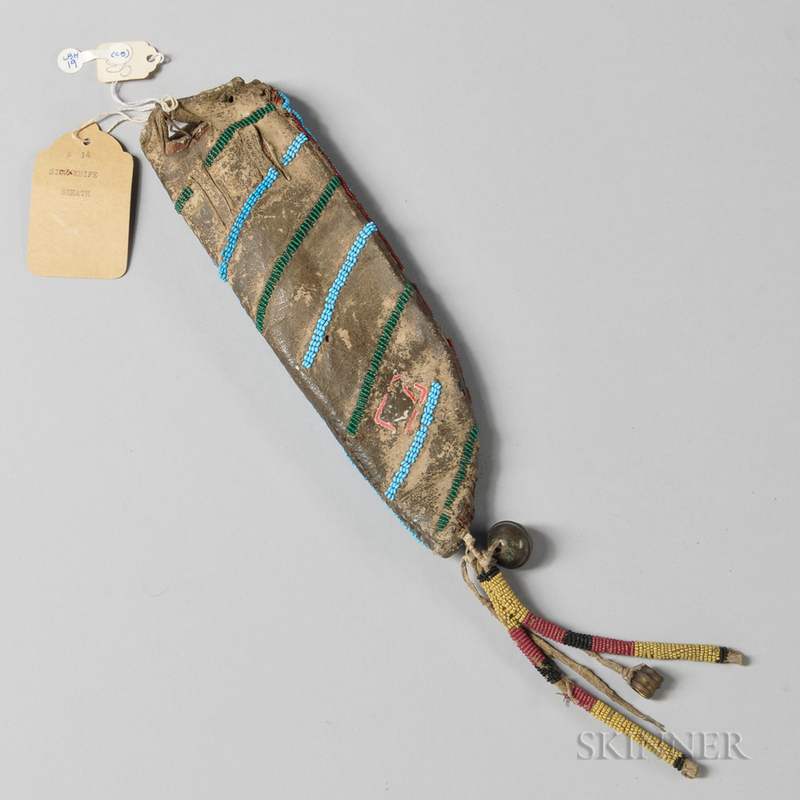 Historic Sioux Beaded Buffalo Hide Knife Sheath from the Little Big Horn Battlefield, c. 1870, beaded on the front with multicolored geometric designs, the back partially beaded with diagonal blue and green stripes, the tassels beaded with yellow, rose, and black seed beads, with a brass hawk bell and small brass attachment, with custom stand, lg. 9, wd. 2 1/2, tassels lg. 5 1/2 in. Provenance: Collected by William O. Taylor, who served with the 7th U.S. Cavalry with Major Reno's troop. Reno and Taylor were part of the group of survivors who had the task of burying Custer and his men. Taylor collected articles from the battle and donated them to the Pocumtuck Museum, where some were on display until 1986. In 1986 items went to auction at the Riba-Mobley Historical Ephemera Auction, and have been held in a private collection since that time. 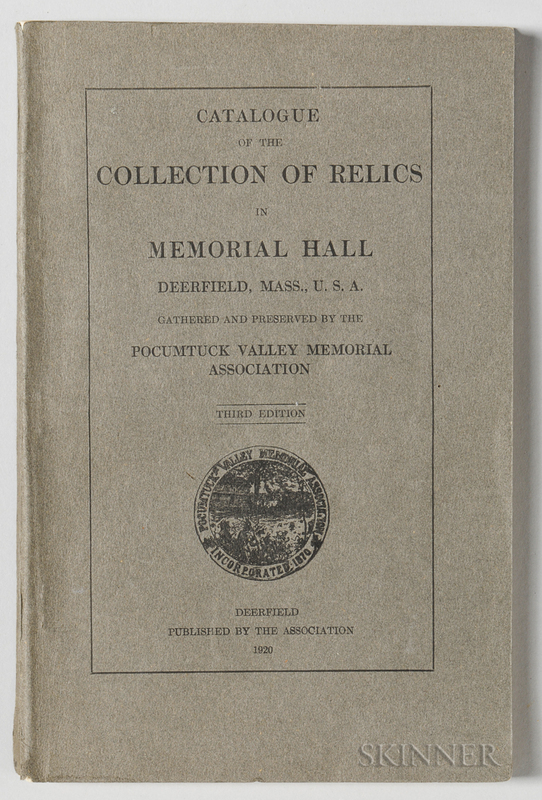 Timeline: June 28, 1876, collected from the battlefield by Taylor; August 1887, donated to the Pocumtuck Valley Memorial Association, Massachusetts (curator, Susan Flint), October 1986, deaccessioned and obtained at auction by collector Alex Acevedo. 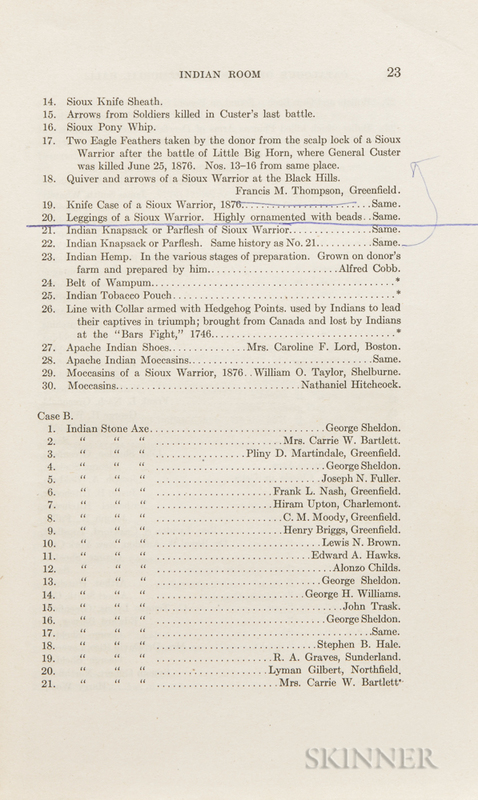 Note: Included with the lot are a copy of Collection of Relics in Memorial Hall, third edition, 1920, along with copies of photos showing the knife sheath with other items collected by Taylor, including Custer's blue cloth shirt from the Black Hills campaign; a copy of the Riba-Mobley auction catalog; a copy of William O. Taylor's memoirs, With Custer on the Little Bighorn, 1996; and a copy of Alex Acevedo's Christmas Book, 1989, where related material was sold.